Thanks very much for your comments, Glad people are enjoying the posts! Next up is a group I bid on at auction unsuccessfully last year (March 2015) which i was really sad about missing out on and to my surprise I saw the group on ebay for less than what I was bidding at the auction. I put a bid on and got the group for £80 less than they sold for! Jasper Johnson was born on the 19th of February 1920 in Bakewell, Derbyshire. On the 14th of January 1939, he enlisted into the 1st Battalion of the Sherwood Foresters. He was a lorry drivers mate at the time of enlistment. He went out to Palestine with the Battalion on the 3rd of August 1939 and therefore qualified for the General Service Medal with bar Palestine. (This is missing from the group and if anybody see's it or knows of its whereabouts, please let me know!) In June 1940, the 1st Battalion moved to reinforce the Garrison of Cyprus where they suffered their first war casualties in an air raid. In early 1942, the Battalion moved out to Egypt and converted to a motorized role and joined the 201st Guards Brigade. Unfortunately, after a sharp engagement in the Knightsbridge box, the Battalion was ordered to surrender when the Garrison in Tobruk capitulated. On the 21st of June 1942, Private J Johnson tried to escape but was captured by a German patrol as he attempted to break through the perimeter. He was sent to 3 different Prisoner Of War camps in Italy being employed on Farms. When the Italians capitulated on the 9th of September 1943, Jasper Johnson was being held at Campo 63 which was at Marinaro Aversa Near Arezzo. This camp was mostly holding Indian troops captured in North Africa so this group is quite scarce! The Sergeant in charge of the camp, ignored the infamous 'Stay Put' order which resulted in so many being recaptured and entrained for Germany. Jasper had been working on a farm and had made friends with the local farm workers. After the armistice, he left the camp and headed for the Farm. He stayed here until the 21st of September 1943. On the 22nd, another farm worker acted as a guide and took him by train to Tirano from which he set off on foot. He began to walk over the mountains to Switzerland. He got lost on the mountains but he met an Italian woman also trying to flee into Switzerland. They camped on the mountains and crossed into Switzerland the next day on the 23rd of September 1943. He was repatriated from Switzerland and returned home on the 22nd of October 1944. On the 12th of June 1945, he married Muriel Beverley in Sheffield and was Demobbed on the 27th of July 1946 as a Class Z reservist. As is common with second world war Prisoners of War who were reservists, Jasper was again called up to serve with the Army in 1950. This time, he was serving with the Royal Northumberland Fusiliers. On the 10th of October 1950, Jasper landed in Korea. The Royal Northumberland Regiment fought at Sibyon-ni, Kan-don, the Imjin River and finally at the Battle for Point 217. During their tour in Korea, the regiment lost 93 killed, 279 wounded and 45 Prisoners. Luckily, Jasper Johnson was not amongst these and left Korea on Sunday the 29th of October 1951 on-board His Majesty's Troopship 'Empire Pride'. For the second time, he was demobbed as a Class Z Reservist on the 23rd of November 1951. Jasper Johnson clearly had a very eventful time with the army and got to travel all over the world. He passed away in December 1984, aged 64. That’s another great group, lucky to buy it cheaper than you were prepared to pay when you first spotted it and good to hear Jasper made it back home after Korea. All your POW groups are difficult to beat but I still think your army/RAF group is one of the most interesting you have. 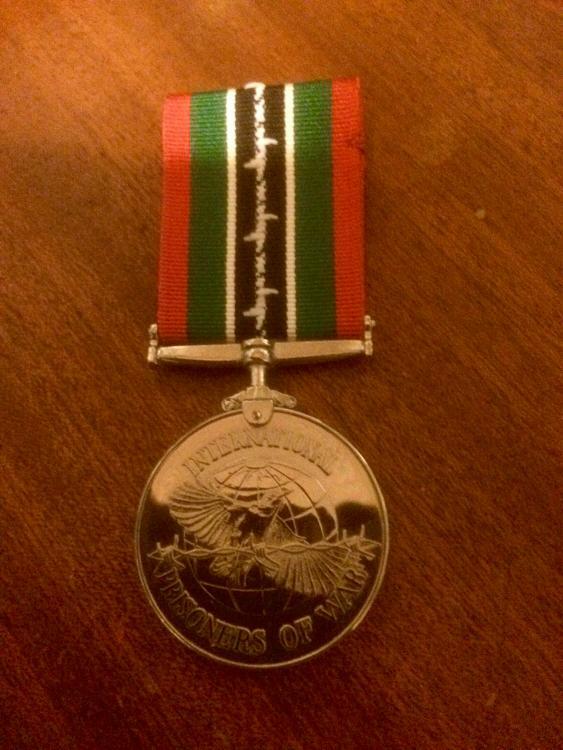 A good few years ago I bought a medal pair to the London Regt. and all I could find on Ancestry was that he was discharged in 1919 due to sickness, I’m now using Find My Past and yesterday I found his service record there. He was wounded in Sept. 1916, sent back to the UK until Feb. 1918 and captured the following month during the German advance, he spent the rest of the war in Hirson, France and Friedrichsfeld POW camp in Wesel, Germany. 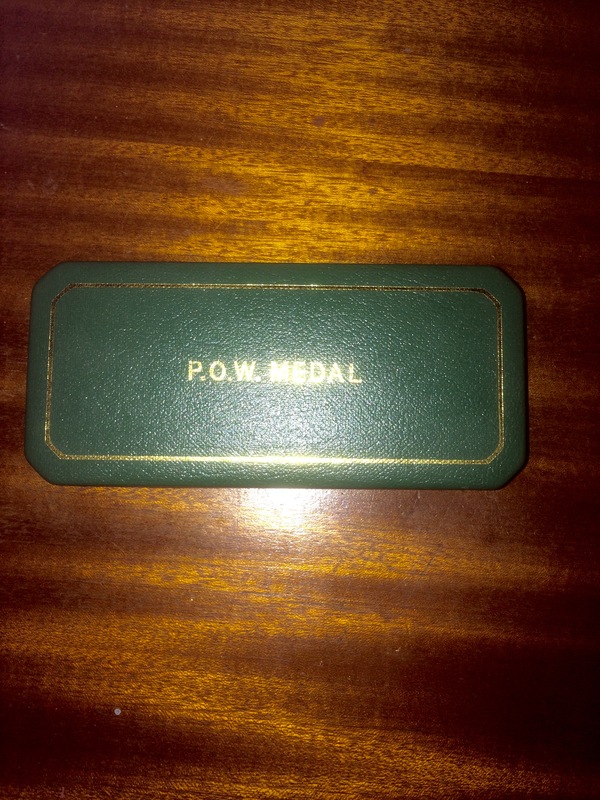 Apart from my wife's grandfather's medals it's the only POW group I have. Thanks Tony! Yes the RAF/Army group is very interesting indeed! It took a lot of time to get the story figured out due to the name change! I also really like the Battle of Britain group as i find it fascinating that he was never heard of again and the true story of what happened to him will probably never be known! What a great find! Ive started using find my past too and i am impressed! They have a lot of very interesting records and often reference where in the national archives certain files are too which is very useful! 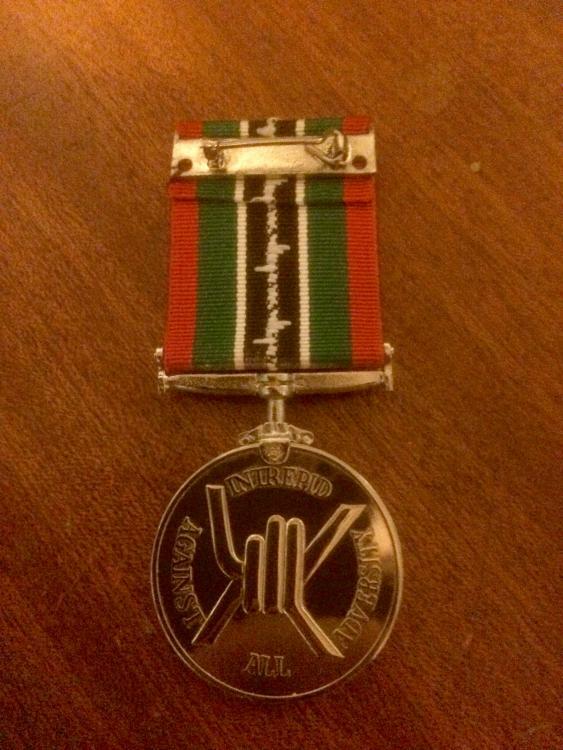 My latest acquisition is the medals awarded to 4338343 Corporal. S. Aston. Durham Light Infantry. Samuel Aston was born on the 1st of August 1901 was from Walston street, Middlestone Moor, nr. Spennymoor, County Durham. He enlisted into the 6th Battalion, Durham Light Infantry on the 10th of July 1938 and at the time of enlistment he was working as a handyman. Samuel went out with the 6th Durham Light Infantry as part of the British Expeditionary Force in 1940. He was captured whilst serving in the 51st Division at Cromberg in Belgium on the 28th of May 1940. Samuel was marched and entrained to Stalag 8b at Lamsdorf in Poland and arrived here on the 7th of June 1940. From the 20th of June 1940 to October 1940, Samuel was sent to an ArbeitsKommando and was employed with sand labouring. From here, Samuel was sent to a different working camp from November 1940 to September 1942 and this time was employed doing tailoring work. In September 1942, Samuel Aston was sent to Stalag 383 at Hohenfels in Bavaria, Germany. Stalag 383 was probably the nicest prisoner of war camp to be in, as there were no work details you could do as you wished with your spare time. Many Prisoners got qualifications and got better read in the library. One New Zealand Prisoner even got his diploma qualification from the British Bee Keeping Society whilst staying here! Some prisoners of kept pets whilst at Stalag 383. Despite the comparatively nice conditions at Stalag 383, there was a thriving escape community and as Arthur had spent the last two years as a Tailor, it wouldnt surprise me if he had been involved in making escape kits! Sadly this is not on his POW debrief so i dont think we will ever have written confirmation. Cpl Samuel Aston was liberated on the 17th of April 1945 and was interviewed by MI9 on the 15th of May 1945. Samuel Aston spent very nearly 5 years of his life as a prisoner of war and when he arrived home, would have been nearly 44 years old. Next up is a group I can do very little research on sadly, but I might contact the Royal Artillery Museum and see if they could assist me. These are the awards of 991780 Gnr Maclean Suttie of the Royal Artillery. He was from Dundee and had a twin who was also in the forces during the war. His brother, Gordon McKinnon Suttie was awarded the Distinguished Flying Cross for his service with 635 Squadron, R.A.F.V.R. He eventually was held as Prisoner No. 226903 at Stalag 4b at Muhlberg in Saxony, Germany. This camp was liberated by the Red Army on the 23rd of April 1945. Maclean Suttie was discharged on the 3rd of January 1946. Up Next is a very standard South African grouping but the story is great. Hermanus Johannes Fouche Venter (What a name!) was born on the 11th of August 1911. Before the war, he was employed by South African Rail as a ticket checker. His private address was in Durban. On the outbreak of war in September 1939, Hermanus enlisted as a Private in the 2nd Battalion, Royal Durban Light Infantry which was part of the 2nd Division. Like so many, Hermanus was captured on the 21st of June 1942 at Tobruk. Hermanus was sent to Italy and arrived at PG 82 at Laterina near Arezzo on the 6th of August 1942. The camp was organised into huts about 40 yards long and 8 yards wide. The bunk beds were in blocks of nine, three on top, three in the middle and three on the bottom of one structure. Not very comfortable or private! There were limited rations in the camp but prisoners were issued one red cross parcel each a week. On the 8th of August 1943, Italy capitulated and the prisoners were free men. However, British high command gave the infamous 'Stay Put' order which was very costly and cost a lot of men their freedom for a couple more years and in some cases, this cost them their lives. On the 10th of August the prisoners of Laterina were called to the parade ground where the Camp Commandant told the prisoners that the Italians had signed a surrender two days earlier. The local population came down to the camp with lots of wine and big celebrations were held. However that night, a local farmer came down to the camp to warn that the Germans were on the way to recapture and entrain all of the Prisoners. The senior officer of the camp decided to ignore the stay put order and let everybody loose to try and find freedom by heading south to join the allied advance, or to head north towards Switzerland. 8000 Allied Prisoners left Camp 82 to try and reach freedom, however 4000 were recaptured and entrained to Germany. Sadly, Hermanus was one of those who was recaptured and sent to Germany. On the 16th of September, Hermanus was put onto a train bound for the Fatherland. On the 20th of September, Hermanus reached his new home at Stalag 8C at Sagan, adjacent to the infamous Stalag Luft 3, the scene of the wooden horse and the great escape. On the 6th of February 1944, Hermanus was transferred again to Stalag 8A at Gorlitz on the German/Polish border. During his time as a prisoner of war in Germany, Hermanus was employed on 3 different working camps. Firstly he was sent to a Sugar Factory in Breslau, next he was sent to Kuhlfort to work in a coal mine and lastly, when he was transferred to Stalag 8A he was employed in a paper factory at Wartha-Frankenberg. Under the sabotage section, he wrote that the Germans considered working slowly and doing very little as sabotage but this is was a method of Sabotage that he and many others adopted. On the 15th of February, the prisoners gathered everything the could carry and prepared for the infamous forced march. The rations were 1 loaf of bread between two men, and 1 tin of meat was to be shared between 10. It seems Hermanus had had enough of the marching and meagre rations as his prisoner of war report says that he was held captive until the 26th of March 1945. He must have escaped the march and headed towards the Allied lines. On his report, Hermanus stated that he did not receive adequate medical attention when it was needed. Also, on MI9 ex-pow debrief reports, there is a section about war crimes which was filled out on a different sheet and sent to a different department. Hermanus did fill out this form which was known as 'Form Q' and i am working on getting hold of it. Hopefully it will turn up another interesting story! He was interviewed about his time as a P.O.W on the 2nd of May 1945 and he was discharged on the 7th of October 1945. Apologies for the weird formatting on the last post! I literally have no idea what happened but i cant seem to be able to change it!! You have chosen a very interesting collecting field! 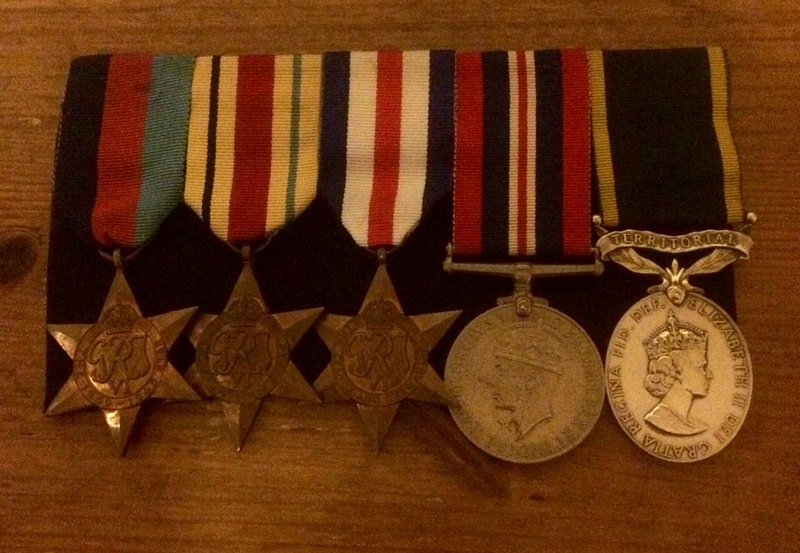 Next up is a very ordinary combination of medals to an extraordinary man. Arthur Thomson was on the 8th of September 1922 in Newcastle-on-Tyne in England. He enlisted into the 9th Battalion Durham Light Infantry on the 14th of May 1942 and at the time of enlistment worked for the Cooperative. 3608465 Pte Arthur Thomson was sent out with the 50th Northumbrian Infantry Division to North Africa in the late 1942 to reinforce the 9th Battalion Durham Light Infantry to replace the troops lost as killed or prisoner during the Mersa Matruh Battle on the 27th of June 1942 in which Private Adam Wakenshaw was posthumously awarded the Victoria Cross. On this day, the 9th Durham Light Infantry lost 20 men killed and 300 taken prisoner. On the 3rd of December 1942, the 9th Durham Light Infantry moved to Galal. During the capture of the 300 prisoners at Mersa Matruh, the battalions payroll of £600 was buried by Lt Pickering. Some more enterprising members of the battalion decided that, although it would be like trying to find a needle in a haystack, to return to the scene to try and find the payroll. Sgt George Lambert, Pte Arthur Thomson, Pte Len Green and Pte Dai Jones returned to the scene of the battle but did not find the payroll. However, what they did find were the bodies of Pte Wakenshaw VC and two other comrades, unburied lying exposed in the Desert. The men reburied their comrades and Sgt Lambert arranged for a Cross for each of the Graves. Arthur later served with the Battalion during Operation Pugilist at the Mareth Line in March 1943. Next up for Arthur Thomson was Operation Husky, the invasion of Siciily and it was here that Arthur was captured on the 19th of July 1943. He was sent to PG 66 where he arrived on the 20th of July. PG 66 which was at Capua, was a transit camp and conditions were pretty rough. During his time here, he suffered from Malaria but he stated that he was given adequate medical treatment. On the 25th of September 1943, Arthur Left the camp and he was taken to Stalag 18a at Wolfsburg in Austria as Prisoner number 7281. From the 14th of October 1943, Arthur was employed on the Arbeitskommando 107/GW at Graz which was a work detail for building air raid shelters. Here he met a fellow Geordie lad named Leonard Slater. In Febuary 1945, Pte Thomson and Dvr Slater decided to escape. In his MI9 report he gave the following account of their escape. Arthur Thomson and Leonard Slater were liberated on the 11th of May 1945. I am very surprised that Arthur wasn't at the very least Mentioned in Despatches for his Escape as he technically escaped 3 times using much initiative and subterfuge. Him and Slater must have been good Linguists to manage to fool the Germans into letting them leave the Gaol. Accompanying the medals are a few documents, which include the notification that he was a prisoner of war at Capua, funnily enough the date is the day he left Capua. Also included were his rejoining order after he was liberated and a document which is sadly only a half document related to his escape along with a pay slip and a national insurance document. Arthur had a very interesting war and it is nice to have the medals of a man captured in an operation which is new for my collection let alone a man who had a magnificent escape! 2581920 Signalman Gerald Hedley Rouse of the Middlesex Yeomanry, 2nd armoured signals division was born on the 31st of January, 1921. He enlisted in the Territorial Army on the 26th of April 1939 and at the time of enlistment was a Bank Clerk living at Lamarrack, South Park Road, Par, Cornwall, England. Gerald was sent out to North Africa with the 2nd Armoured Division but was Captured at El Mechili, Libya on the 8th of April 1941. From here, he was taken to Prato All Isarco near Bolzano in Italy, probably via Benghazi and or Derna, arriving here on the 12th of August 1941 and leaving for a permanent camp on the 23rd of October 1941. On the 24th of October 1941 he arrived at his new home for the next 2 years at PG 78 at Sulmona. On the 8th of September, the Italians capitulated and fled from the camp and thankfully the commanding officer decided to ignore the 'Stay Put' order and let the men try to escape. Unfortunately he doesnt give the length of time that he was out, but he arrived at Stalag 7a at Moosburg on the 12th of November 1943. This would imply that he was out for pretty much two whole months so he must of damn nearly made it. On the 29th of April 1945, the 14th Armoured Division of the United States Army liberated the camp after a short and uneven battle with the retreating Germans of the 17th SS Panzer Grenadiers and the 719th infantry divisions although they only possessed small arms and most of them surrendered along with the 240 camp guards. Gerald filled out his MI9 Debrief on the 12th of May 1945 and then returned to civilian life. 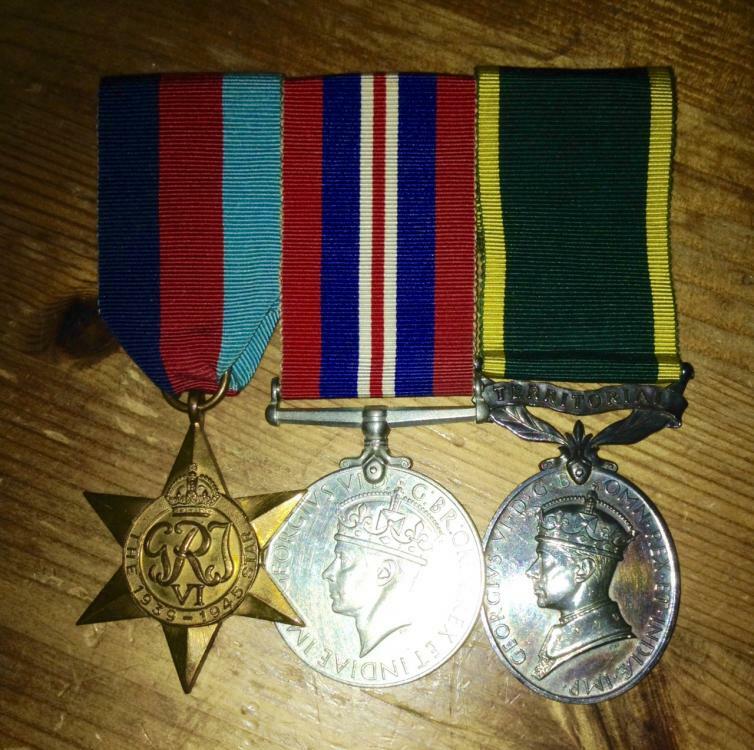 unfortunately I only have his Territorial medal and as his other entitlement (39-45 star, Africa star and War medal) are missing and as they were issued unnamed, they will probably never be reunited which is a shame but its nice to have his territorial medal in the original box although its sad that he probably never wore his hard earned medals. PS sorry about the images being sideways! They were not taken sideways but for some reason when i uploaded them, they turned at 90 degrees and i cant figure out how to rotate them! Next up is my first POW Casualty group. 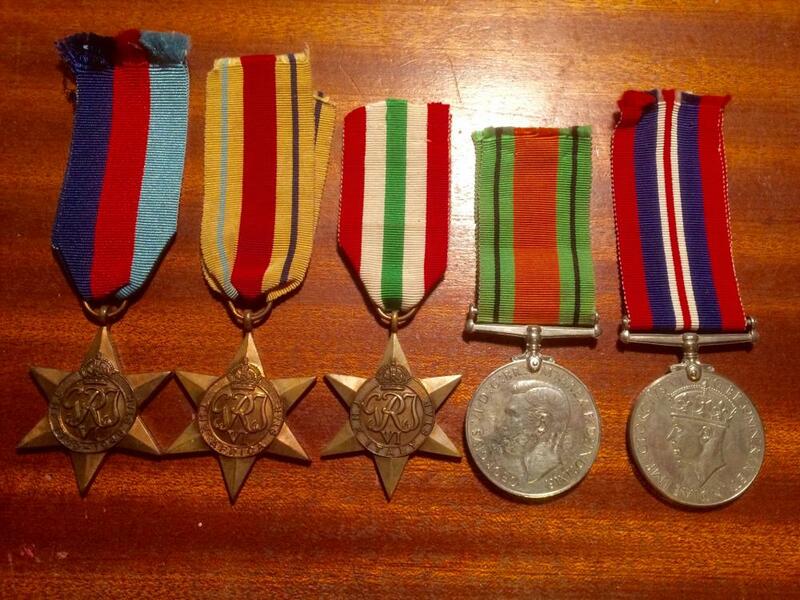 This group of medals are the 1939-45 star, Africa Star and 1939-45 War Medal but sadly the Africa War Service Medal is missing. They are named to 214378 Trooper F Horrocks of the 7th Reconnaissance Battalion of the South African Tank Corps who was captured at Tobruk on the 21st of June 1942. At the time, the battalion was equipped with Marmon-Herrington II armoured cars. On the 13th of July 1942, the battalion was disbanded as the casualties were so numerous as either killed or taken prisoner. Horrocks was initially held at PG 85 but after the Italian Capitulation, he was transferred to Stalag 8c at Sagan which was alongside the infamous Stalag Luft 3. He was given the POW number 76111. This is where the story gets more interesting..
On the 8th of February the camp was evacuated and marched away from the advancing Russians and they were marched just over 500km to Stalag 9b at Bad Orb which is notorious for being the POW camp with the worst conditions. Sadly, Trooper Horrocks never made it. Along with 11 other South Africans including a couple of his fellow 7th Recce Battalion, S.A.T.C comrades, Trooper F Horrocks died on the 27th of February 1945 and was buried in a mass grave with them at Obergrunstedt which was 325km from Stalag 8C at Sagan. I am of the belief that these men all attempted to escape and were killed in the process. My reason for this is that only 22 South African Servicemen died between 01/01/1945 and 28/02/1945 and were buried in Germany or Poland. All of the other ten casualties had died on different days and were interred in a range of cemetery's where as the 12 including Horrocks were all found in a mass grave at Obergrunstedt and all died on the same day. I think that is especially more likely that they had tried to escape as there were 3 men of the same battalion who were captured together and would have been friends. At first i thought it unlikely that a group this size would try to escape so i dismissed the theory, but then i read an MI9 report of a man who escaped the march at night in a group of roughly 50 men and made it to the allied lines! The only other reason that i could think of 12 prisoners dying on the same day would be if they were accidentally strafed by allied planes, however, i cannot find any reference to the allied forces accidentally strafing this group of prisoners. Only the more famous cases like the Stalag 357 Fallingbostel forced march. If anybody has any thoughts/theories i would love to hear them, and also if anybody has access to the Reports regarding war crimes from Stalag 8c i would be very interested to see what they say! Trooper Horrocks was the son of James and Alice Horrocks of Port Elizabeth, Cape Province, South Africa and in 1951, his remains were removed from the original mass grave at Obergrunstedt and reinterred in at Berlin War Cemetery for 1939-1945. He was 32 years old when he died. Sorry again for the pictures being the wrong way around!!!! If anybody knows why this keeps happening when i go to upload them/how to rotate them, please let me know! Fascinating read Rob. Niche collecting is the best! Are you by any chance uploading from an iPad or iPhone? If so, I have found that the sideways upload issue can be cured by editing your pictures individually before uploading. Just crop them very slightly, rotate them four times (i.e 360 degrees), save and upload. Works for me on another forum where I ran into this issue. Thanks for the comment, glad you enjoyed reading! I took the photos with my phone and then sent them to my laptop same as always, but I'll give it a go for my next post and see if the problem goes away! Thanks for the advice! Thanks for sharing those great sets. I really appreciate the Korean War bar. It is funny how they seemed destined to be in your possession! I am glad you have enjoyed these posts, I am rather fond of the Korean set too! Could not believe my eyes when I saw it on eBay at a lower price then what id already bid at auction! Ive missed out on some other amazing lots in the past, so fingers crossed I'll get another chance at some of them too! Next up took some detective work but luckily enough, the name is unique enough so that I was successful in identifying this chap. I saw this group on a dealer website for £100 including next day delivery and the combination was enough to spark my interest. The group is: The 1939-45 star, Africa star, France and Germany star, War medal and QE2 Territorial Medal - the last named to 21002238 Sgt P.A.D Cartwright. I knew that this combination would indicate a birth after 1921 since he wasn't in the Territorials during the war since he got awarded the T.M post 1953. The group indicated to me that it was an Arnhem POW. Peter A.D Cartwright was born in the second quarter of 1923 in Edmonton, Middlesex. Peter joined the General Service Corps and was probably sent to the Royal Artillery with service number 14242349 probably in mid 1942 and was sent out to North Africa. After his time in North Africa, he transferred to the Army Air Corps (still trying to find out if he was a Para or Glider Pilot regiment) but he was taken prisoner at Arnhem and held at Stalag XI-B at Fallingbostel as PoW 117911. After he was repatriated, he returned to civilian life but his QE2 territorial medal service number would indicate a pre 1950 enlistment. Probably around 1948-49. Coincidentaly, Peter and his wife (Married in '41 probably just before leaving for Africa), had a son who was also P.A.D Cartwright who was born in 1949. Peter most likely joined the Territorials to earn a bit more money due to starting a family. I am trying to get hold of his POW debrief if it exists and I'm hoping above hope that it does as most Fallingbostel POW's that I've researched did fill out debriefs! Sorry about the poor quality photo! Next up is a fairly recent first world war purchase that i forgot to post about a while ago. Harry French was born on the 15th of Novemeber 1892 in Worksop, a town on the Northern Edge of Sherwood Forest in Nottinghamshire. He lived at 35 Belmont House, Doncaster. Harry enlisted as 20591 Pte French of the 1st Battalion Kings Own Yorkshire Light Infantry and entered France on the 21st of April 1915. Harry was captured during the Second Battle of Ypres on the 8th of May 1915, only 16 days after he landed in France. His first camp was Giessen, then he was moved to Lichtenhorst from the 23rd of August 1916 til the 2nd of December 1916 when he moved to Langensalza from which he was repatriated at the end of the war. One of Harrys comrades from the 1st KOYLI's was wounded and sent back to England to recover. On the 5th of June 1915, the Sheffield Daily Independant published his account of the Battle which led up to his wounding and Harry French's capture. and his comrades had made their way to a position occupied by another regiment. off by a bullet, which did not even touch my hair. officer came dashing past and helped me." 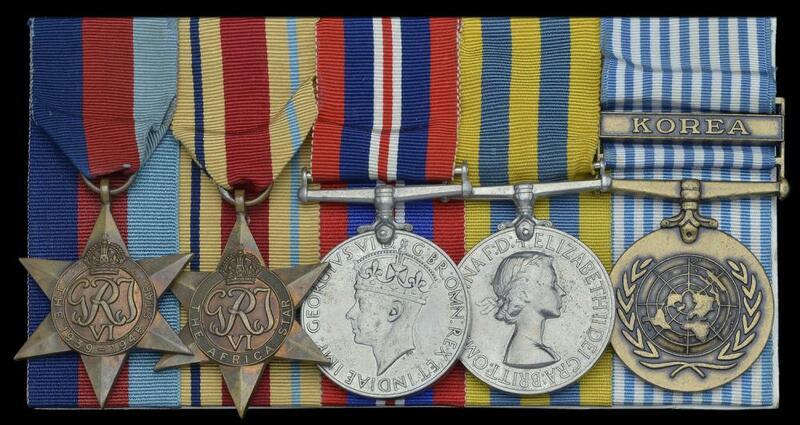 A rather interesting medal, sadly i only have his 1914-15 star and his BWM and Victory medal are still out there. Maybe one day they will be reunited! A nice addition. It is indeed possible to unit it with its companions. I've united four groups of medals and one plaque over 40 years. So good luck with that. Your collections just keeps on getting better and better. Thank you for doing all the wonderful research and sharing that; after all, it's the man behind the medal that counts, eh? I look forward to your next post! Id love to reunite a group soon! Must feel so rewarding to bring the medals back to one collection. I have a Royal Navy Petty Officers medals to a relative, i have his Khedives star and Royal Humane Society life saving medal but his Egypt medal is sadly missing! Hopefully it will be somewhere at my grandmothers house where the others came from. 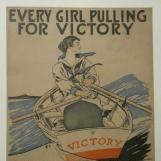 I also had the pleasure of buying a Victory medal and Plaque to a 19 year old who was from my village. I used to sit next to his name on our war memorial in church back when I was a chorister! He died in April 1918 and had already been serving for over a year so he may have enlisted at 17! Sadly the BWM isn't there so i have a bad feeling that it was scrapped in the 1970s when the silver prices rose. My next post will be a long one to the MBE officer i mentioned to you, i'm sure you're going to enjoy it! 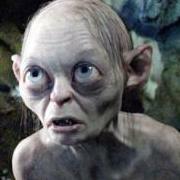 Got my hands on his mugshot photo too which is brilliant, i love putting a face to a name! Next up is probably the most visually pleasing POW group in my collection and is a recent acquisition. On the 23rd of September 1919, John enlisted the Royal Garrison Artillery in Oxford. At the time, he was 5'8, 128 lbs, described as having brown eyes, dark hair and a fresh complexion. After training, he was sent out to Palestine on the 10th of January 1920 and then stopped at Alexandria and Malta. After arriving back and serving at home in early 1922, he was sent out to Constantinople (Modern day Istanbul) arriving on the 29th of September 1922 serving here until the 6th of September 1923. This coincided with the end of the Greco-Turkish war of 1919-1922 and the collapse of the Ottoman Empire. After this, John served at home from 7/9/23 to 27/4/34. Next was Gibraltar from 28/4/34 to 20/9/35, Egypt 21/9/35 to 1/9/36 and back to Gibraltar until the 28th of January 1937 before being sent back home for service there.By this time, he had worked his way from Gunner to a Sergeant. During his time in the ranks, he passed qualifications in 3rd, 2nd and 1st class education, Class A swimming and qualified as a signaller. He was awarded his Long Service and Good Conduct medal (Sadly missing from the group) with Gratuity in 1938. He was posted to the 68th HAA Regiment as a Sergeant on the 9th of April and on the 1st of May 1938, he was promoted to Warrant Officer 2nd class being promoted to Warrant Officer 1st class and Acting Regimental Sergeant Major on the 1st of May 1939. Around this time he was awarded the Meritorious Service Medal and on with the second world war breaking out, he was promoted to War Substantive Regimental Sergeant Major on the 2nd of December 1939. In 1940 he was recommended for officer training. His conduct was described as Exemplary and the testimonial is as follows: "A Warrant Officer (class 1) of the best type - well educated, efficient, reliable and a good disciplinarian. RSM Hawkins has a record of good service of which he can be justly proud. His work and conduct have been beyond reproach at all times and his energy, ability and trustworthiness have now been rewarded by his promotion to commissioned rank. His fine example merits the highest praise". Once his officer training was complete, John left Liverpool as a Lieutenant on the 6th of Febuary 1941 and arrived at Durban on the 22nd of April 1941.From here, he travelled up to North Africa being seeing action in the Middle Eastern theatre. John was Captured on the 17th of July 1942 at El-Alamein and was confirmed as a prisoner on the 22nd of July. On the 15th of December 1942, John was Mentioned in Despatches presumably for his actions at El-Alamein. From here, John was moved to Campo 21 at Chieti, an old monastery which had a particularly evil Fascist commandant who public beat to death a recaptured officer who had escaped the camp. At the time of the Capitulation, the senior officer followed his orders and did not allow any prisoners to leave the camp, even posting his own officers as guards. The Germans unfortunately took over the camp. There were quite a few tunnels being dug from March 1943 and about 40/50 officers hid in these tunnels (for example, John Jenkins whose medals i own and are written about previously in this thread). Since John's service record confirms that he was entitled to the Italy star, he must have escaped the camp by hiding in the tunnel and emerging after the rest of the prisoners had been taken away on the trains. He might have been in the one of the parties who met the A Force agents and SAS/Para's who were sent to round up Ex-POW's or he might have joined Partisans and fought briefly with them. Either way, he found himself being recaptured and sent to Oflag 8F in Czechoslovakia. This camp was moved to Oflag 79 in Braunschwig in April 1944 and John went with them. He was Liberated by the Allied forces on the 12th of April 1945 and jumped straight back into action serving for a month in North West Europe. From here he was sent back to the UK. "Major (Q.M) J.H.C Hawkins R.A, has been Quartermaster of 262 (M) H.A.A Regiment R.A (Territorial Army) since the reconstitution of the Territorial Army in 1947. Throughout this period, he has shown a devotion to duty which far surpasses the requirements of his appointment. He has worked tirelessly and devoted by far the greater part of his leisure time to the affairs of his Regiment, particularly in regard to the social and welfare side. He has made it his business to extend his military knowledge to an astonishing extent and, not only is he a tower of strength to his own regiment, but in addition on many matters his counsel is sought by higher formations. His ceaseless vigilance both on and off duty, the breadth of his knowledge, and the wisdom of his counsel have contributed more than any other single factor to the growing success of the Regiment throughout the period since it was reformed. After thirty three years of service in the Regular Army, of which the last thirteen have been commissioned, Major Hawkins is shortly to retire. He has set for himself the highest possible standard of service, and i cannot praise too highly his achievements over the past years. I strongly recommend the award of the M.B.E in recognition." John Hawkins was clearly a very professional career soldier who must have had a lot of respect from his seniors and subordinates alike. He saw lots of the world as a soldier and must have endured many hardships during the war and his time as a prisoner. 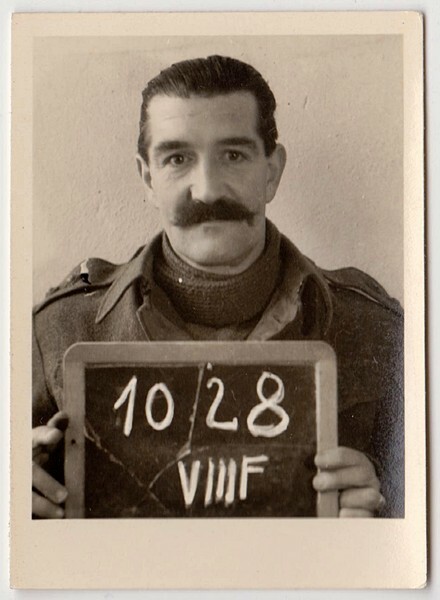 I was very pleased to find his POW Mugshot picture and to notice he sported a very impressive moustache! Great write up Rob! Thank you for sharing this. I love the photo; smiling when captured; that stiff upper British lip! Great! Yes it's a fantastic picture! I found a collection of mugshot photos from this camp and there are lots of great pics of the boys smirking and smiling at their guards! Next up is a medal which I just found in my collection and had completely forgotten that I had! The Allied Ex-Prisoner of War medal is a commemorative medal proposed by the Ex-Pow association the UK for all Ex Prisoners whose countries were allies of Britain at the time of their capture irrespective of whether the United Kingdom was involved in the conflict or not. The ribbon has a very specific design. The ribbkn has a symbolised strand of barbed wire bounded on either side by black bands representing the despair of the compound. These in turn are edged by white bands representative of the second and third fences of the compound. The bands of green are reminiscent of the fields of home and finally both edges are symbolic of the burning faith of those who were interned. A very attractive medal, and it is a shame I do not know who this medal was awarded to. There is an issue number on the label on the back of the box so I will contact the company who made them and see if they have a list of who each medal was awarded to.